Digitization has long since become established in the heating systems sector. But until now no lean communication solution was available for small boilers. 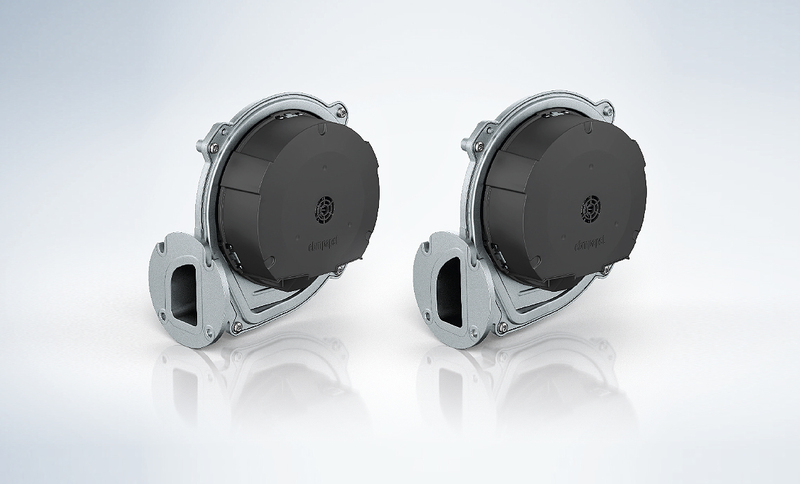 LIN-capable gas blowers from ebm-papst are about to change all that. To the advantage of manufacturers, fitters and end users. Cars that let you know when they need servicing. Washing machines that can be operated by smartphone. Fully automated production processes in which workpieces communicate with one another. There is hardly any area of life and hardly any application that have not yet been conquered by digitization – and that includes the heating systems sector. For some years now, users have enjoyed the benefits of mobile internet control over their heating systems. But this still has plenty more potential to offer. Although users and devices are already able to interact, there has until now been virtually no digital communication within the gas condensing boiler itself, in other words between combustion controller, control system, pumps, valves and blowers. The individual components are packed with intelligence and constantly produce data, but the central combustion controller has not been able to make use of this. All that is about to change. The Local Interconnect Network (LIN-Bus), a communication solution that has already been employed in the automotive industry for many years, is now becoming established for condensing boilers as well. The LIN is standardized in accordance with ISO 17987, thus guaranteeing communication compatibility with different components. The serial field bus system interconnects sensors, actuators and their control devices in a network. For condensing boilers, this means: Pumps, valves, sensors and blowers are linked to the combustion controller. The LIN-Bus is a single-master/multi-slave system. The combustion controller is the master in this case. On the basis of a defined schedule, it regularly requests data from the system components (the slaves), evaluates the information, and sends back commands (see box for an explanation of how this works). A prerequisite is that the system components are LIN-capable. Engineers at ebm-papst already developed a gas blower that satisfied the technical requirements ten years ago. But no other LIN-capable components were available for heating systems at that time, so that the concept was not able to gain a foothold. Since then, other manufacturers of components such as pumps have however followed suit. And so, for the first time, boilers now exist that are able to make use of this well-established communication system. The two ebm-papst VG 71 and VG 100 blowers (Fig. 1) for a heat output up to 50 kilowatts from the RadiMix product range are LIN-capable. This power range makes them suitable for use in individual houses and apartment blocks. Sizes VG 108 and VG 122 for up to 150 kW are set to follow in the future. Boiler manufacturers can now also make use of sensor data which up until now the blower was only able to process internally but not transmit to the combustion controller. This includes information on power consumption, speed and ambient temperature. A new feature is the analysis of voltage fluctuations, which permits evaluation of the network quality. The software was programmed by ebm-papst to create defined data packets, so-called LIN messages (Fig. 2), that are called up by the combustion controller. This data, as well as additional sensor values in future, will enable manufacturers to further optimize combustion and thus make the boiler more efficient. Because the LIN-Bus is bidirectional. It does not merely serve the purpose of calling up data, it can also be used to transmit commands. So the option now exists of positioning the speed controller directly in the blower. The speed can thus be regulated more quickly and more precisely, which in turn provides scope for extending the modulation range. What’s more, moving the control system to the blower relieves the load on the computational capacity of the combustion controller. Fig. 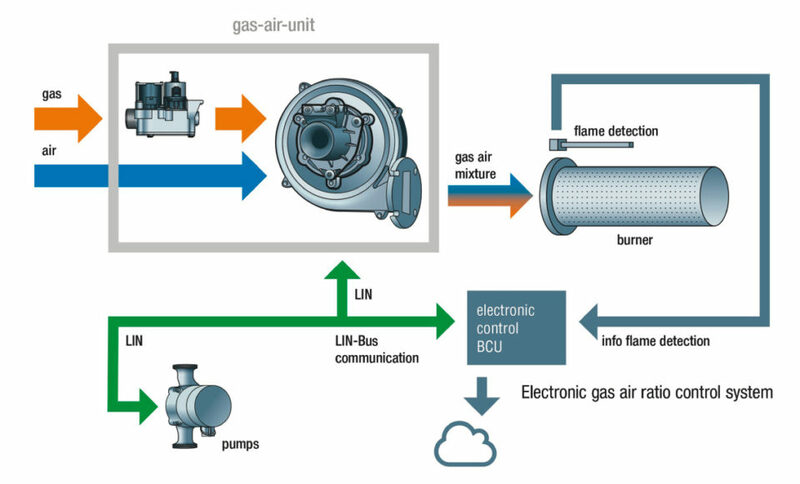 3 illustrates LIN-Bus communication in a gas boiler. The ease of reading out data is also of great advantage for maintenance purposes. It has long since become standard practice for cars to automatically indicate that the engine oil needs changing or to report brake wear. In the event of a fault, all the workshop mechanic has to do is to connect up a laptop and read out the fault and diagnostic data to be able to rectify the specific problem. The LIN-Bus makes this a real option for heating system fitters as well. They can then identify the problem directly on the monitor and so avoid having to perform extensive trouble-shooting and random component replacement. The evaluation of operating hours, start-stop cycles and ambient temperature profiles permits simple status monitoring with LIN blowers. In the future, predictive maintenance will also be possible thanks to LIN-Bus communication. This is an extremely valuable function for end users, as it minimizes the risk of sudden failure and provides advance warning of imminent failure. Gas boilers will be able to report the need to exchange components – before the fault actually occurs. The combustion controller then receives a LIN message indicating that maintenance and replacement are necessary. If the boiler is also linked up to the internet, the information will be automatically sent to the fitter, who can then read out the diagnosis and bring the right replacement part straight away. Showers suddenly running cold will then be a thing of the past. The Local Interconnect Network, or LIN-Bus for short, was defined in 1998 in the automotive industry as a low-cost serial communication system. The standard was defined by a LIN consortium. The single-master/multi-slave system permits the connection of up to 16 slave units. The master – in the case of a condensing boiler the electronic control system – determines when the slave – i.e. the blower for example – is to supply data or follow commands. This takes place at cyclical intervals on the basis of a specified time schedule stored in the master. As all slaves are connected to a single cable, a so-called “Packet Identifier” (PID) is sent with each transmission so that the slave concerned recognizes that it is being addressed. A LIN message (Fig. 2) has a maximum of 64 bits. Speed, temperature values or status signals are stored in this, for example.